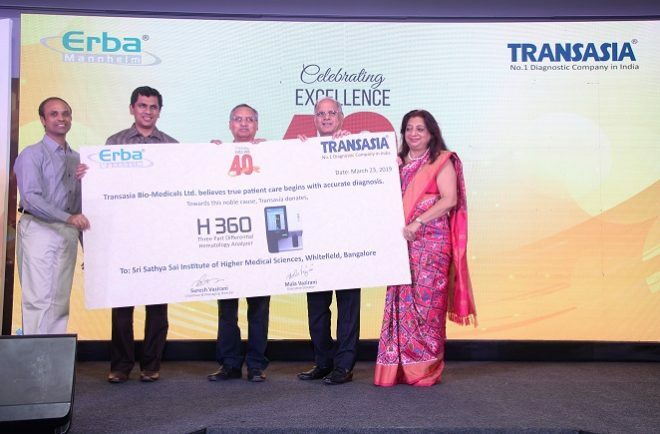 Bengaluru: Transasia Bio-Medicals, India’s Leading In-vitro Diagnostic Company has donated its newly launched hematology analyzer, H 360 to Sri Sathya Sai Institute of Higher Medical Sciences, Bangalore. This is in support of the institute’s most urgent need for essential instruments, for more precise diagnosis, faster treatment and improved outcomes. The H 360, is a three part differential fully automated hematology analyzer, developed at Transasia’s European subsidiary – Erba Europe. With its ability to detect CBC and WBC Differential with high precision and accuracy, H 360 will be useful in screening of anemia & its causes, indicating the presence of hemoglobinopathies, helping in detection of cytopenia, septicemia or leukemia and platelet related pathologies & disorders. Speaking on the occasion, Suresh Vazirani, Chairman & Managing Director, Transasia Bio-Medicals said, “I am immensely proud of Transasia’s continuing association with the Sri Sathya Sai Institute of Higher Medical Sciences in aid of a very noble cause. The impact of the good work done by the institute has benefited not only the poor patients in Bangalore but also those from the nearby areas. At Transasia, we believe in operating with a higher purpose, with an unwavering focus on ensuring equitable and affordable access to diagnostic facilities. In the more than two decade long association with the institute, Transasia has provided its instruments to the institute. This latest version of the instrument will be able to offer four more extra parameters for in-depth analysis. Alongwith the H 360, Transasia also announced the launch of two more 5 Part Differential Fully Automated Hematology analyzers, H 560 and Elite 580. Together this entire new range, with a host of features will help institutions, clinicians and laboratory technologists offer accurate diagnosis. The launch of these analyzers has come at an apt time, as Transasia celebrates its 40th anniversary.